The following extract was taken from the South African magazine Home Front, of May 1990. The article is by Charles Churchill, a Wireless Operator awarded the DFM after the epic daylight raid on the MAN diesel engine factory at Augsburg. ‘O - Orange’ …. again she was to be our kite for my fourth last trip. With only four to go, I was really feeling nervous. I was beginning to realise that there was a strong possibility after all of completing this Lancaster tour … I had never really thought so clearly on this matter before. It seemed that I had been on ops for years, but suddenly I could visualise being free from that feeling of doubt. I had the great fortune to survive the longest daylight low level attack on a German target and for this had been awarded a DFM. 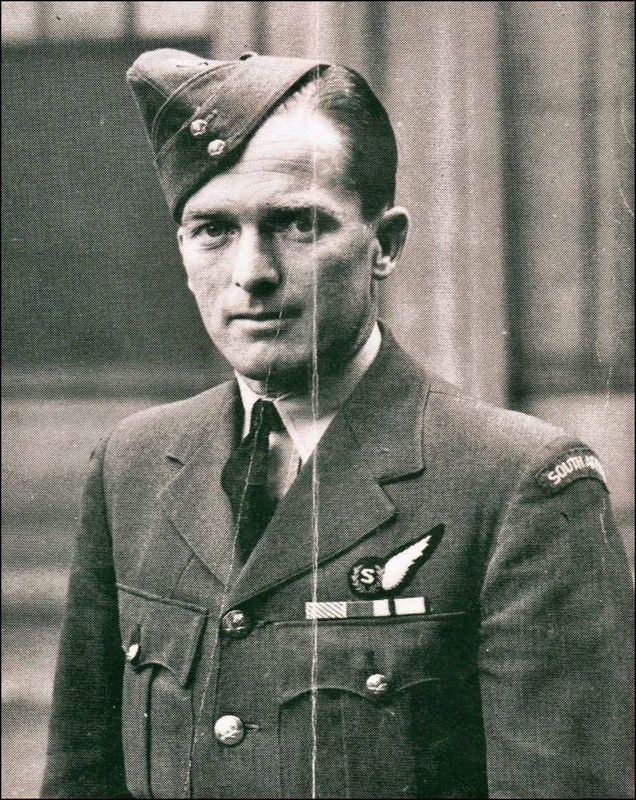 My pilot, Sqn Ldr J D Nettleton, had been awarded the VC. And now, only four trips to go … I could start to dream. My friend and fellow South African Fg Off Dennis Nicholson was this night on his second last trip. If he got back from this one, there would be only one to go. Dennis and I planned that if we both survived, we should make application to be posted to Training Command and from there we would apply to be sent to our home, South Africa, where a huge training organisation was operating. 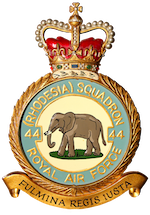 Dennis, a pilot, would probably be sent to 42 Air School in Port Elizabeth (our home town) and I possibly would get a post as an instructor at a gunnery school in George or Oudtshoorn. When our six months rest had expired, we would both apply for transfer to a squadron operating in the Middle East and possibly end our war service at least in our own continent. But with four to go it is not advisable to become too optimistic, so I switched off the projector that was showing this wonderful picture. Tonight I was flying with my first pilot, Fg Off Bill Day, a Rhodesian, and we both had ‘four to go’. We were using the old faithful ‘O - Orange’. We had done a few dicey trips in this dependable old kite, so I had reason to believe that we would return from this one. The target was Duisberg. We were taken to our kite at the dispersal by our usual WAAF driver. She was what was known as ‘lucky for us’. Every time she had taken us to our kite, we had had a good trip and she claimed never to have lost a crew, so things looked good. As you can perceive, most of us were, as we approached the end of our tour, very superstitious. We were conscious of things such as the lucky driver, the charms and religious medals given by friends, wives, sweethearts and well-wishers - and many other trifling things. But I am certain that our custom of urinating on the tail wheel prior to takeoff was unique. However, our preparations and takeoff were normal and we were soon airborne and quickly back to our routine. The crew seemed to be silent and Bill Day called us up periodically on the intercom and tried to instil some sort of life into the crew. My special job on this trip, apart from receiving the half-hourly transmissions, was to make a written record of the transmission of the mobile beacons, which I was doing when the eager thick Scots voice of our Bomb Aimer, Jock Glynn, informed us that there was what appeared to be a ship that was either beached or anchored offshore. We were flying at about 20,000 feet and visibility was not very good. Jock wanted to go down and have a look at her, but Bill Day refused. However, he told Navigator, George Wiley, to note the position and that when we had bombed our target, we would, on the return journey, drop a flare and take a photo. The target at Duisberg was tough. There were lots of powerful searchlights and box barrages. We saw an aircraft coned by searchlights and exploded by ack-ack gunfire. We bombed our target and set course for the ship we had sighted on the way out. We were soon over the ship (dead on track) at a height of approximately 20,000 feet. Bill Day circled around our objective, losing height. The light was improving but still not good enough for us to identify with any certainty. He did not want to get too low because of the danger of flak, so he instructed the Bomb Aimer, Jock Glynn, to select a flare. The bomb doors were opened, Jock pressed the flare release - and then it happened. There was a loud crack and the whole plane was enveloped in a white light, the brightest I had ever seen. We seemed to be alight. I thought we had been hit by incendiary ammo. Someone shouted “Fire extinguishers!” I made a grab for mine in the radio compartment but suddenly the Lancaster seemed to stand on one wingtip and I was hurled across the plane, losing my intercom link in the process. I very quickly retrieved my earphones and tried desperately to get back into the picture. The aircraft was still diving and it seemed as though we were steeply banked. Suddenly the engines seemed to be screaming in a steep climb. Then the light disappeared and we were back in the comparative darkness on an even keel. Then the intercom came alive with shouts of “What the hell was that all about?” The gunners and myself were completely mystified. But the Navigator, Bomb Aimer and Pilot had guessed correctly that the flare had hung up in the bomb bay and Bill Day had almost turned the Lanc on its back in attempting to do a violent jink to shake the flare loose - which he eventually did. By the time the flare had been released, we were well away from the ship. We set course for base, quite shaken. For Bill Day and myself, it was now three to go.